MIL suddenly asked us out for dinner with a newly wed couple who are relatives. And asked me whether I can make a cake for them. 22 hours notice! To make a cake for the newly wed couple as a simple dinner celebration, is not like a birthday cake or a regular cake, I have to incorporate romantic elements into it. I can only make do with whatever I have in hand. I have mangoes, limes, chocolate, coffee and no berries at all in the fridge. So, it's either I make a mango cake or a mocha flavoured cake. Scratch my head, my brains and scoured the internet for cake with romantic elements that I can make with a short period of time and the limited choice of ingredients. Lastly... 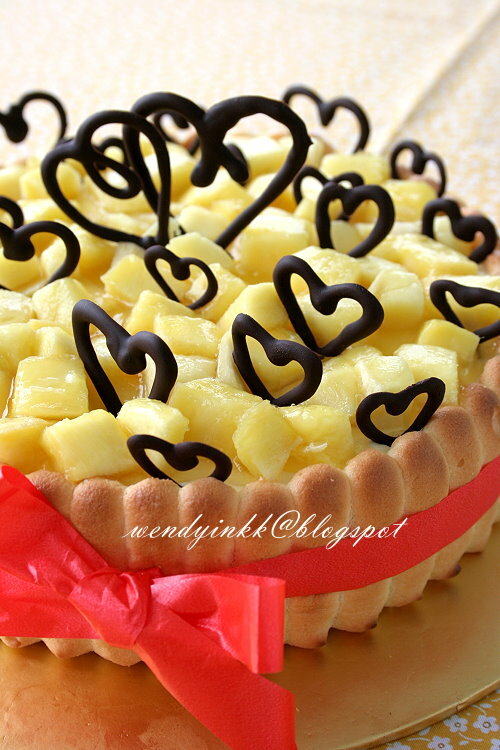 I went with a mango charlotte, and decided to pipe chocolate hearts as deco. A Charlotte always looks elegant, I won't need to think too much about last minute touch ups and the cake is already ready and chilling a few hours ahead. My mangoes weren't sweet and fragrant, and so I marinated them with sugar, lots of sugar. Still they weren't very sweet and the flavour was missing. But the looks of the charlotte is considered ok. Feeling very dissatisfied, I hunted for better mangoes and then made it a second time few days later. This time I added lime to the mango to give the fragrance a lift. Feedback.... much better than the first cake. 2nd cake gone in one sitting when I brought it to Mike's office. Bake as per the recipe. Line sides and base of an 8inch spring form pan with sponge fingers. 1. Place water into a heatproof bowl. Sprinkle gelatin in and let it bloom for 2 minutes. Melt it, method refer here. Let it cool down while you do the following steps. 2. Mix mango puree, mango cubes, lime juice and zest together. 3. Whip whipping cream until stiff and place in fridge. No need to wash beaters. 4. In another bowl, beat cream cheese until smooth (no lumps) and put in sugar and beat for a while. Put in yogurt and beat on low speed until well incorporated. Remove cream from fridge and beat in on low speed. Then the gelatin, beat in on low speed too. Finally, the mango mixture, beat in too. 5. Pour the cream cheese filling into the prepared sponge in pan. Chill for 3 hours and then do the next step. 3. Mix the cold mango cubes with melted gelatin and toss to get them evenly coated with the gelatin. Let it sit for a while (1-2 minutes) so the gelatin will thicken a bit. 4. 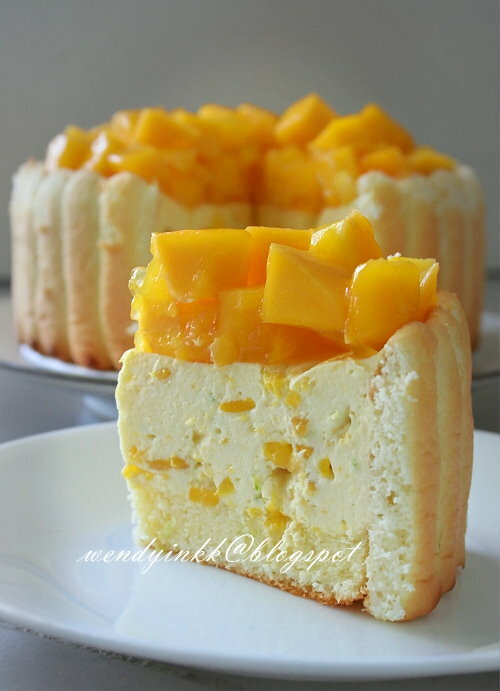 Spoon the mango cubes over the half set cake (top has set) and chill for another 2 hours minimum before serving. Wow ... so pretty and yummy! 22 hours notice? i'm sure will panic !!! hahahaha...but not u la..always the best frm chef wendy! 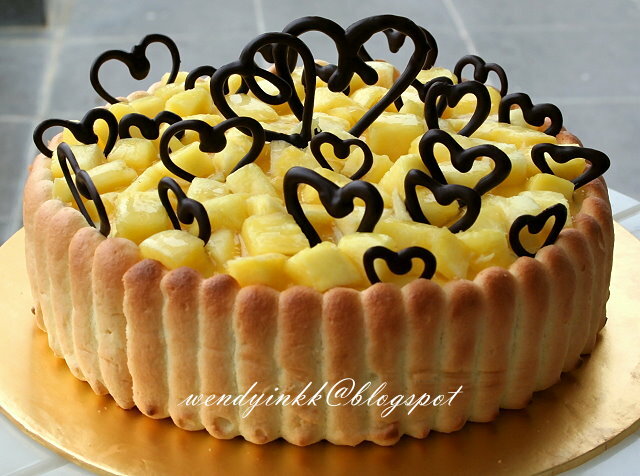 Love this mangoes cheesecake. Pack with mangoes flavourful! Very well decorated! Can you share how you pump the choc heart? You are really a genius Wendy. Scratched your head a bit and viola, such an elegant presentation! Bet your MIL must be mighty proud of you. I love your blogs. I tried several of your recipes here and all are yums! Thank you for taking your precious time and effort to share your recipes here. 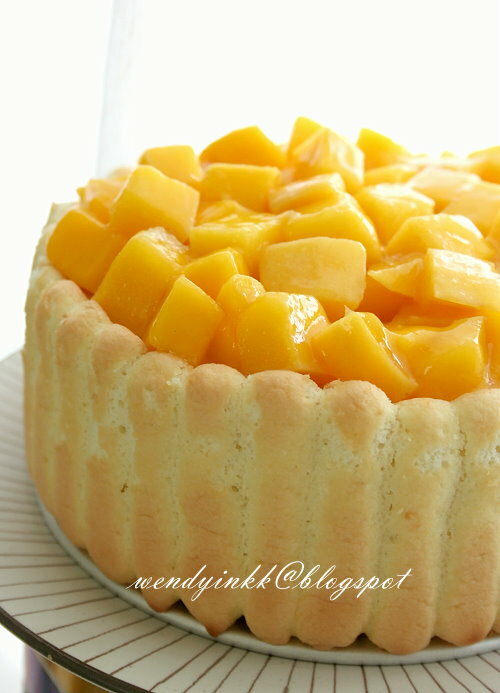 I've made this Mango Cheese Charlotte Cake last weekend. Majority love it but I received some reviews saying the sponge fingers are a bit dry. I followed your recipe closely. I am just wondering if you have any tips to make the sponge fingers more 'moist'? I tried googling for 'moist' sponge fingers but no avail. To me, the sponge fingers I made tasted like those store bought but softer. Most probably your fingers were overbaked. Thank you for your prompt reply and tips. Will try baking a new badge of sponge fingers this weekend, following your tips. I read that your 'cuti anak' finishes in 2014. I hope that you'll continue to blog even when you join back teaching. Hi wendy, im so going to try this recipe. Look just tantalizing! Can i know how many inches is your pan? Is it best to use springform? Beat the gelatin for a few seconds as long as it's incorporated, then it's enough. I think what happened to your cream is that, either the gelatin has set, you left it around, or the mango was sourish that it curdled the cream. You can beat the mango first, then gelatin, if you are afraid you can't work fast enough. But adding the gelatin first could prevent sourish mango puree from curdling the cream. Contact me on Table for 2's FB, and send me a picture so that I can advise you further. The cake looks fabulous. I want to make also! Can I chilled the cake overnight THEN only I make the topping on the next day afternoon? Hi, I made this cake today and it turn out really well. 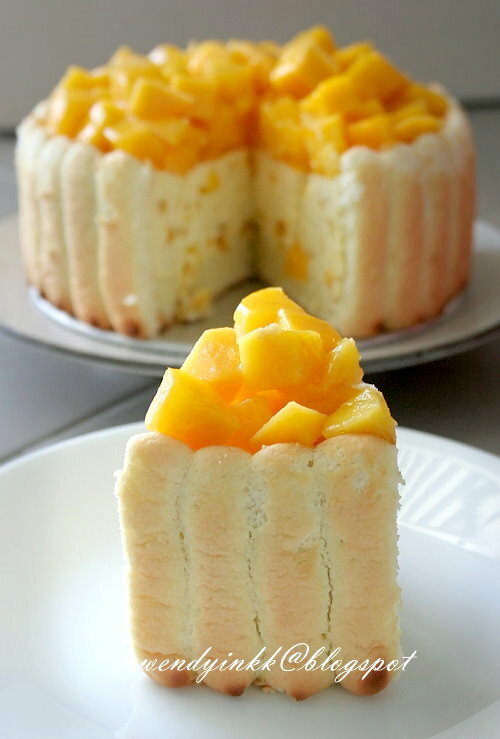 I sandwiched with mango filling. Thank you for sharing. Glad that it turned out well, having lots of mango in between some cheesecake sound fabulous!